Two men who have built bridges between Canada’s indigenous and Jewish communities will speak about reconciliation, forgiveness and resilience at Temple Sholom’s Selichot program. Robbie Waisman, a survivor of the Holocaust who was liberated as a child from Buchenwald concentration camp, and Chief Robert Joseph, a survivor of Canada’s Indian residential schools system, will address congregants on the subject of Forgiving But Not Forgetting: Reconciliation in Moving Forward Through Trauma. The event is at the synagogue on Sept. 1, 8 p.m.
Waisman is one of 426 children who survived Buchenwald. At the age of 14, he discovered that almost his entire family had been murdered. He came to Canada as part of the Canadian War Orphans Project, which brought 1,123 Jewish children here under the auspices of Canadian Jewish Congress. Joseph is a hereditary chief of the Gwawaenuk First Nation, located around Queen Charlotte Strait in northern British Columbia. He spent 10 years at St. Michael’s Indian Residential School at Alert Bay on the central coast of the province. He recalls being beaten for using his mother tongue and surviving other hardships and abuse. A leading voice in Canada’s dialogue around truth and reconciliation, the chief is currently the ambassador for Reconciliation Canada and a member of the National Assembly of First Nations Elders Council. He was formerly the executive director of the Indian Residential School Survivors Society and is an honourary witness to Canada’s Truth and Reconciliation Commission. Waisman and Joseph have become close friends over years of discussing, publicly and privately, their respective histories and the challenges of building a life after trauma. Waisman has become a leading Jewish advocate for indigenous Canadians’ rights. 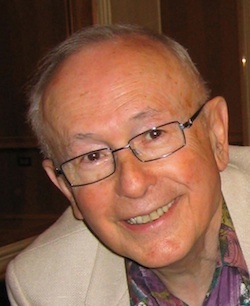 Waisman believes that the experiences of Holocaust survivors and the example that many survivors have set of assimilating their life’s tragedies and committing themselves to tikkun olam is a potential model for First Nations as they confront their past and struggle to address its contemporary impacts. One of Waisman’s first experiences with Canadian indigenous communities was when he was invited to the Yukon. His presentation was broadcast on CBC radio and people called in from all over the territory, asking that Waisman wait for them so that they could come meet him. This was a moment when Waisman realized the power of his personal story to help others who have experienced trauma gain strength. The Selichot program was envisioned by Shirley Cohn and the Temple Sholom Working Group on Indigenous Reconciliation and Community, which Cohn chairs. “It’s the right thing to do given the political atmosphere, the increased awareness about indigenous issues and just the fact that, as Jews, I think we need to be more tolerant of others, and these are really the first people in Canada, and they’ve suffered discrimination, as we have, and I think it’s important,” she said. The message is especially relevant at this time of penitence and self-reflection, she added. “It’s a time for thoughtfulness and looking inward,” said Cohn, who is a social worker. Rabbi Carrie Brown said the Temple Sholom community sees the topic as fitting. This is “not just a one-off program,” the rabbi stressed, but the beginning of a process of education and conversation. The Vancouver Holocaust Education Centre extends a mazal tov to board director and longtime volunteer Robert (Robbie) Waisman, who received the degree of honourary doctor of laws from the University of Victoria on June 13. Waisman was one of the “Boys of Buchenwald” before he was liberated from the concentration camp, eventually emigrating to a new life in Canada, where he built a successful career and now dedicates himself to Holocaust education. He is a community leader, a philanthropist, a founder and past president of the VHEC, and an extremely effective educator who promotes social justice and human rights for all by sharing his experience as a child survivor. Audiences impacted by Waisman’s VHEC outreach activities include thousands of British Columbian students each year, as well as students and community groups throughout Canada and the United States. He has served as a mentor to survivors of the Rwandan genocide who were wanting to share their eyewitness accounts. Also notable, Waisman was inducted by the Truth and Reconciliation Commission as an Honourary Witness in 2011, and has spoken alongside First Nations leaders and survivors of residential schools about reconciliation and healing. A retired high school teacher, Bellas taught English and theatre arts for 32 years in the Delta School District. She directed more than 100 popular plays and musicals at Delta Secondary School in Ladner. 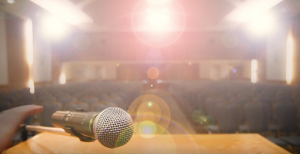 Many of her students have graduated to become successful actors, writers, directors and educators, and they keep in touch with their first teacher/director. She was president of the Association of B.C. Drama Educators, and was instrumental in procuring funding for and in the designing of Genesis Theatre, a fully professional theatre in Ladner. Bellas was born and raised in Vancouver. She attended Sir Winston Churchill High School and Schara Tzedeck Synagogue Religious School. She developed her strong community commitment through youth activities in Young Judaea, Camp Hatikvah, Camp Biluim and working as a camp counselor. In university, she was involved in the Student Zionist Organization and held leadership roles in Hillel. 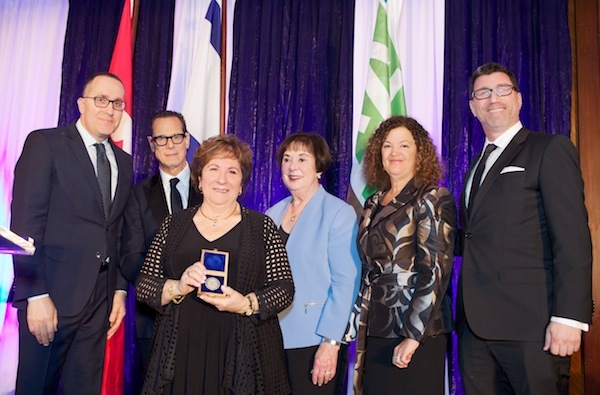 She became a charter member and eventually president of Atid chapter of Hadassah-WIZO Vancouver; she also served as the Vancouver council vice-president. Since her retirement in 2003, Bellas has used her many talents and skills to serve her community: three years as secretary of the Jewish Seniors Alliance, four years on the board of the Louis Brier Home and Hospital and president of the ladies’ executive of the Richmond Country Club. She also directed musical shows at Vancouver Talmud Torah, produced souvenir books, chaired and worked on dinner committees for Congregation Schara Tzedeck, Vancouver Talmud Torah, Israel Bonds and the JNF. In 2013, Bellas and her husband Joel, z’l, were awarded the Betzalel Award at Schara Tzedeck Synagogue. Most recently, she chaired a very successful fundraising gala for RAPS (Regional Animal Protection Society). Bellas served as president of JNF Pacific Region from 2012 to 2015. She remains active to this day, continuing as a board member, chairing and co-chairing Negev Dinner committees and producing the souvenir books. Bellas is on the national board of JNF and states that she is very proud to be part of such a proactive organization for the benefit of the state of Israel. Bellas attributes much of the success of her stellar volunteer career to the loving support and encouragement she received from her beloved husband Joel, z’l. Hebrew University of Jerusalem is known for innovation. With nine Nobel Prize and Fields Medal winners among its alumni and being ranked 12th in the world for biotechnology patent filings, there is an abundance of creativity and ingenuity emanating from the university. 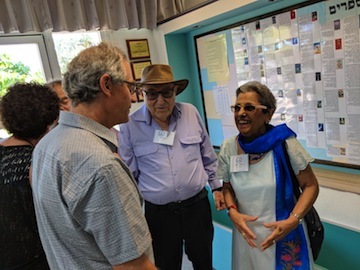 It should come as no surprise then that the Canadian Friends of Hebrew University (CFHU) co-convened a fundraising event honouring cardiologist Dr. Saul Isserow on June 28. Hosted by CFHU and VGH & UBC Hospital Foundation in the Landmark Aviation Hangar at YVR, the casual-chic event – which sold out just weeks after it was announced – hosted a capacity crowd of 500-plus people. The huge walls of the hangar were draped and a lighting and sound system had been installed along with a cabana that was a full-service bar. There were five food stations, including one serving South African specialties. One wall of the hangar was open to the runway and a private jet was on display to top off the evening’s decor. Among other things, Isserow is director of the Vancouver General Hospital Centre for Cardiovascular Health, director of cardiology services at University of British Columbia Hospital and medical director of Sports Cardiology B.C. “It’s not in my nature to be fêted in this way,” said Isserow in his address, stressing that the evening was intended to be a fun night to celebrate the achievements of the cardiac team with whom he works, as well as his heartfelt support and love for the state of Israel. There were more than three million reasons for celebration by the end of the night – to be exact, $3,046,350 was raised to support two initiatives. The money will be divided between CFHU’s Inspired by Einstein student scholarship program and, locally, Isserow’s Sports Cardiology B.C. program at UBC Hospital. Barbara Grantham, chief executive officer of the VGH & UBC Hospital Foundation expressed her gratitude to Isserow for agreeing to be honoured at this event. She said Isserow is a humble man who works tirelessly for his patients and credits his team for his successes. A short video tribute to Isserow and his journey from South Africa to Canada revealed that he and his wife, Lindsay, began their lives in Canada in Nipawin, Sask. His journey from rural Saskatchewan to the upper echelon of Vancouver’s cardiology community is a testament to his talent and perseverance. In addition to Grantham and Isserow, CFHU national board chair Monette Malewski gave brief remarks, which were followed by a performance by the Emily Chambers band while dinner was served. The crowd was treated to a short African drumming performance prior to a brief address by Ambassador Ido Aharoni, who spoke about the strong connection between the principles of Hebrew University founding member Albert Einstein and Hebrew U’s function as a launch pad for creative innovation in all areas. After Isserow addressed the group, the evening was rounded off with a DJ and dancing. 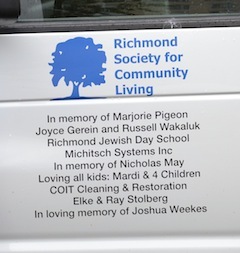 For the past few years, Richmond Jewish Day School’s Student Council committee has been collecting donations to support different charities throughout the Lower Mainland. 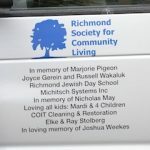 As part of their ongoing fundraising, the school was able to donate $1,150 to the Variety Club Sunshine Coach program and the school’s name was recently inscribed on the side of a 15-passenger Sunshine Coach, which will be used by Richmond Society for Community Living. The vehicle will transport youth with diverse abilities to various programs throughout the city. 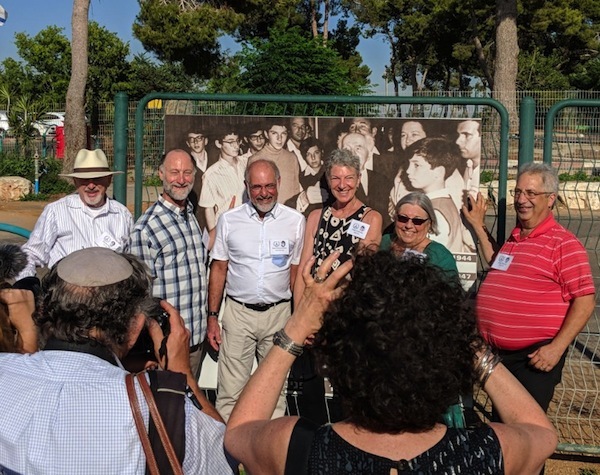 Last month, several Canadians – or former Canadians – attended the 50th anniversary of Hadassim Children and Youth Village in Israel. Reunion organizer Rabbi Shawn Zell and the other attendees were among the first young Diaspora Jews to spend a year in Israel on a sponsored program – in their case, one organized by Canadian Hadassah-WIZO. Students from Prince of Wales Secondary School and, of course, from KDHS also joined the assembly, which was organized by KDHS teachers Anna-Mae Wiesenthal and Aron Rosenberg, and included Cantor Yaakov Orzech chanting El Malei Rachamim. The multi-school initiative was led by Wiesenthal, who is currently pursuing a master’s degree in Holocaust and genocide studies. Last year, she went to Austria and Poland with the Sarah and Chaim Neuberger Holocaust Education Centre of Toronto. In addition to teaching about the Holocaust at KDHS, she has been giving presentations at various public schools. She told the Jewish Independent that students have been very engaged and have asked many questions. This outreach led to the recent assembly at KDHS, where other schools’ students were invited to attend. Wiesenthal, who has taught at KDHS since 2006, became interested in focusing more on Holocaust education after attending an educators seminar at Yad Vashem in 2012. Wiesenthal also admitted to being inspired by a possible kinship with renowned Nazi hunter Simon Wiesenthal. Her great-grandfather, Mattityahu Wiesenthal, was a Russian boy saved from forced conscription in the Russian army by being “thrown across the river” from Russia into the town of Skala in Austria-Hungary, as many boys were at that time. As an orphan in Skala, he was taken in by Moshe Efroyim Wiesenthal, who supported many such refugee orphans, and the young boy took the family name Wiesenthal to honour his patron. Wiesenthal does not know if Moshe Efroyim was directly related to Simon Wiesenthal, but the latter remains one of her heroes, and she has been in touch with his granddaughter, Racheli Kreisberg. Wiesenthal also recently initiated a pilot project at the Vancouver Holocaust Education Centre (VHEC), in which KDHS students trained as docents (museum guides) lead other students through the exhibit. Another project was an art exhibit at KDHS, where her Jewish History 11 class viewed a video of a Holocaust survivor’s testimony, chose an aspect of the testimony that stood out for them and then created a work of art based on that aspect. Each work was accompanied by an artist’s statement, a picture of the survivor and why the student chose the testimony they did. Contributions included painting, sculpture, writing and music. “The quality of expression was very moving,” said Wiesenthal. Rabbi Stephen Berger, head of Judaic studies at KDHS, said he is thrilled with the work Wiesenthal has been doing. The head of Canada’s Truth and Reconciliation Commission is crediting Robbie Waisman, a Vancouver man and a child survivor of Buchenwald concentration camp, with making a significant impact on the work of the landmark national initiative. Justice Murray Sinclair, the first Aboriginal judge appointed to the Provincial Court of Manitoba, headed the commission that handed down its report earlier this year. It is a compendious study of the legacy of Indian residential schools in Canada, with recommendations for redress. Over the course of a century, an estimated 30% of Aboriginal children in Canada were taken from their family homes and placed in residential schools. Funded by the federal government and run by Christian churches, the schools forbade children from speaking their native languages. Countless numbers were physically and sexually abused, even murdered, starved to death or died from lack of medical attention. Of the estimated 150,000 children who went through the system, 4,000 are believed to have died. Survivors have struggled for decades with the legacies of the experience. The Truth and Reconciliation Commission (TRC) was the first comprehensive nationwide effort to address the history. Sinclair told the Independent that Waisman made a crucial suggestion that informed the work of the commission. It can be extremely difficult for survivors to tell their stories directly to their children, Waisman told Sinclair. He himself did not tell his own children about his experiences in the Holocaust; they learned some of the details by witnessing their father tell his history to others. The commission took this advice to heart, said Sinclair. Waisman participated in the entire TRC process, traveling to every part of Canada to speak with residential school survivors about his own story of survival and about creating a life after experiencing the most unimaginable horrors. 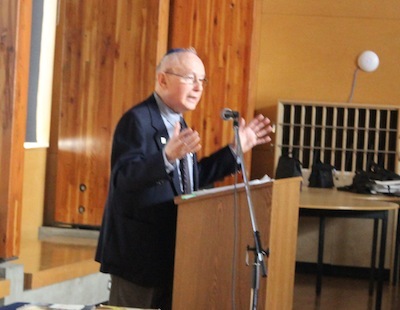 On Nov. 18, Waisman spoke at the Jewish Museum and Archives of British Columbia about his experience in the Holocaust and about participating in the TRC. Waisman has been involved with First Nations communities for years. He was first contacted by Canadian Jewish Congress when David Ahenakew, a former national chief of the Assembly of First Nations, uttered antisemitic comments in 2002. CJC engaged with First Nations leaders and brought Waisman to meet with them. Waisman’s relationship with CJC goes back further – as an orphaned child survivor, he was sponsored to come to Canada by CJC. Because of his effectiveness as a speaker, Waisman was invited to speak to residential school survivors in the Northwest Territories. As he spoke, he noticed maybe a dozen people in booths, speaking into headphones. It turned out his words were being translated into local dialects and broadcast across the territories. A trip that was supposed be a daylong in-and-out turned into a four-day sojourn as residential school survivors came from surrounding villages to meet him. Sinclair is full of warm words for Waisman. “He’s a stalwart supporter and a warm and kind and loving man who always understood what the survivors were talking about and let them know that,” said the judge.